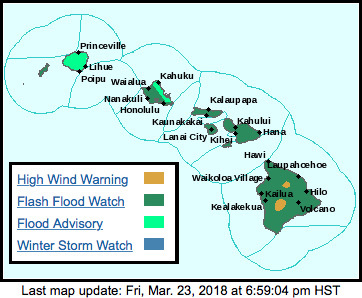 The National Weather Service in Honolulu has issued a Flash Flood Watch for all Hawaii Islands in effect from this evening through Sunday afternoon (March 25). A developing area of low pressure south of the state will spread deep moisture and unstable conditions across the smaller islands. Periods of heavy rainfall and possible thunderstorms may result in flash flooding. Heavy rain with thunderstorms and high winds are forecast through Saturday. Winter weather conditions, including high winds, are expected for the summit areas. Department of Parks and Recreation reports all parks, including the Kalapana lava viewing area, will be closed Saturday. As a precaution, consider canceling or postponing outdoor activities. Residents in flood-prone areas are advised to be on the alert for possible flooding conditions. Motorists are advised to exercise caution while driving. Road closures may occur without notice. Be on the alert for possible malfunction of traffic signals. Treat flashing traffic lights as a four-way stop. Remember, if lightning threatens your area, the safest place to be is indoors. Take measures to secure items around your property that may be affected by strong winds. Complete all preparations before nightfall. Campers and hikers should avoid low lying flood prone areas. People should stay away from streams, drainage ditches and low lying areas prone to flooding. The rainfall and runoff will cause hazardous driving conditions due to ponding, reduced visibility, and poor braking action. Excessive runoff may cause rockslides and mudslides in steep terrain. High Wind Warning in effect until 6 a.m. Sunday (March 25) for Hawaii Island summits. Warning, which is in effect until 6 AM HST Sunday. Winds are coming from the west increasing to 60-80 mph with gusts up to 100 mph for Hawaii Island summits. The strong winds can make driving difficult especially for high profile vehicles. Motorists should use caution while driving. The winds can also forcefully swing doors open or shut so use caution when opening or closing vehicle doors. Consider postponing driving or hiking to the summit until conditions improve. If camping near the summit, be sure tents are well secured. A Winter Storm Watch is in effect from Saturday morning through late Saturday night (March 24) for Hawaii Island summits. Heavy snow possible. Storm total accumulations in excess of 6 inches may occur on Hawaii Island summits above 12,500 feet. Roads to the summit may rapidly become snow covered and slippery. Strong winds combined with heavy snow and poor visibilities may result in blizzard conditions at times.